Visual Design for the HRI2009 Conference | Christoph Bartneck, Ph.D. 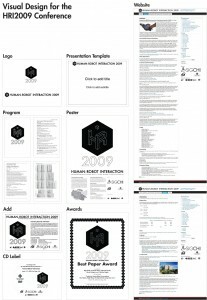 In 2009, I was responsible for the design of the visual communication for the HRI conference. This included the design of the web site, the program, posters, CD-Labels. I compiled a poster that shows all the graphics produced.